James Spann has the weather forecast for a new Alabama work week from Alabama NewsCenter on Vimeo. CLOUDS, BUT DRY: We expect the cloud cover to hang tough over the northern half of Alabama today, but the low levels are fairly dry and the day should be dry. Like yesterday, temperatures won’t get out of the 40s. Down in south Alabama, some sun is likely with a high in the 50s. MIDWEEK: Dry weather is the story tomorrow and Wednesday; we project a partly sunny sky both days with a slow warming trend. The high tomorrow will be close to 50, followed by mid 50s Wednesday. Clouds will move in Wednesday night, and Thursday will be a cloudy day with rain likely by the afternoon, continuing Thursday night. Rain amounts from noon Thursday to midnight Thursday night should be around one-half inch for most communities. FRIDAY/SATURDAY: Friday will be a dry day with intervals of sunshine and a high close to 60 degrees. On Saturday, clouds thicken and more rain is likely Saturday afternoon and Saturday night ahead of a very dynamic system. Thankfully, we are not expecting any surface-based instability, so severe storms should not be an issue. The main window for rain comes from about noon to midnight Saturday, with amounts of around 1 inch possible. Saturday will be relatively mild with a high close to 60, but don’t get used to it. 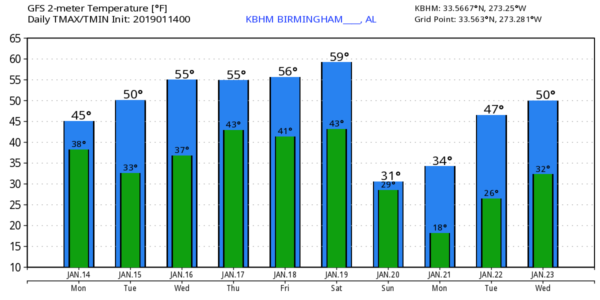 COLDEST AIR SO FAR THIS SEASON SUNDAY: A deepening surface low will move east of Alabama after midnight Saturday night, and as the rain moves out, the coldest air so far this season will move in. Sunday will feature a strong north wind of 15-30 mph, lingering clouds and temperatures that stay below freezing all day over north Alabama. The wind chill index will hover in the single digits, and a few snow flurries are possible in the colder air Sunday morning. It is important to stress that both global models (GFS and ECMWF) show nothing more than flurries with no impact. The big story is the cold air. Temperatures across the northern half of Alabama will drop into the 10- to 18-degree range early Monday morning as the wind calms down and the sky becomes clear. NEXT WEEK: Monday will be sunny but cold, with a high in the low 40s. The next storm system arrives by Wednesday or Wednesday night, and temperatures should moderate by then, with just rain expected. Once again, while flurries are possible late Saturday night or Sunday morning, for now there is no sign of any high-impact winter precipitation for Alabama in the next seven to 10 days.